One way to work with users to show possibilities and probabilities for how scenarios from the future might play out is by creating an immersive experience using experiential futures. Recently, a group from OCADU’s Foresight Studio looked at the futures of the Canadian Cultural Economy. We created a time machine derived from one of the 4 quadrants (2×2 matrix for scenario planning) in which we created and mapped our future state scenarios in 2023. In one of our scenarios we looked at a society that was fully branded and where privacy was non-existent. The brands owned the content—of literally everything. 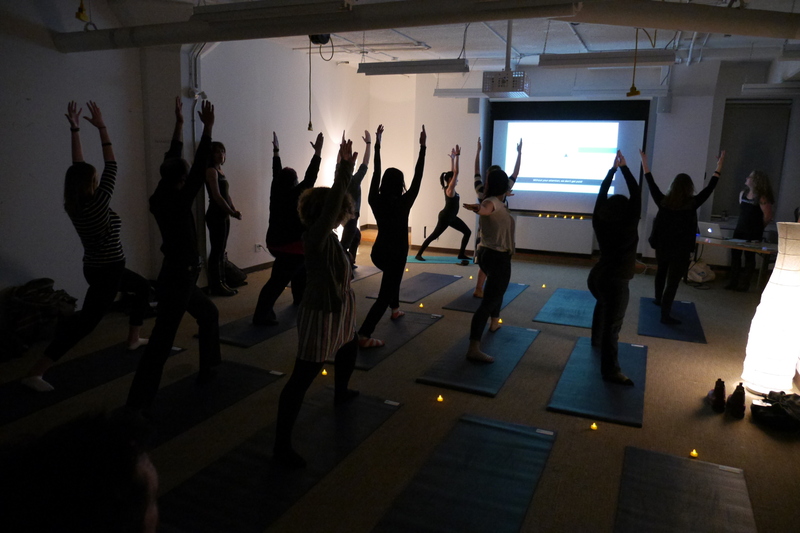 We conducted a deceptively traditional yoga class branded “Namastate“. Namastate coordinator greets the Namastate participants and sets the tone. Upon entering everyone received a branded wristband that was meant to monitor not only your heart rate and blood pressure, but your mood and cravings and engagement levels. It would also tweet your thoughts on your behalf. 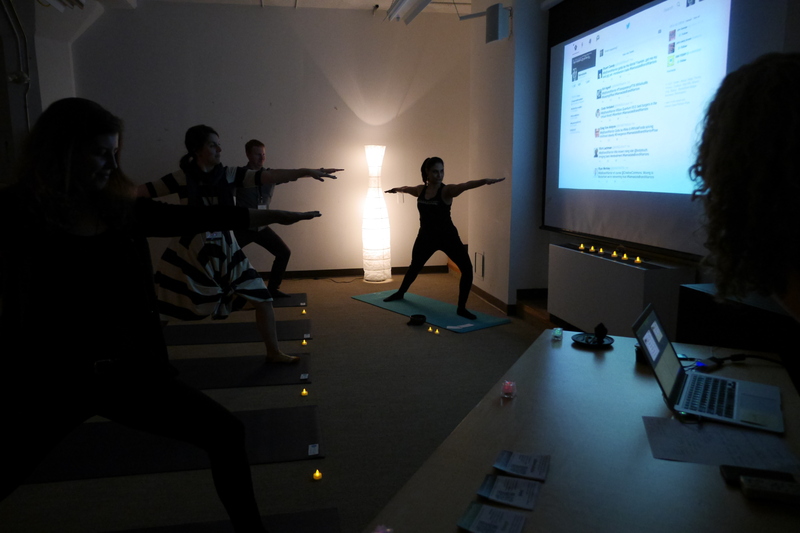 The room was set up to resemble a traditional looking yoga studio, where mats, candles and music created a relaxing atmosphere. Participants were lulled into a feeling of familiarity and comfort at the beginning. 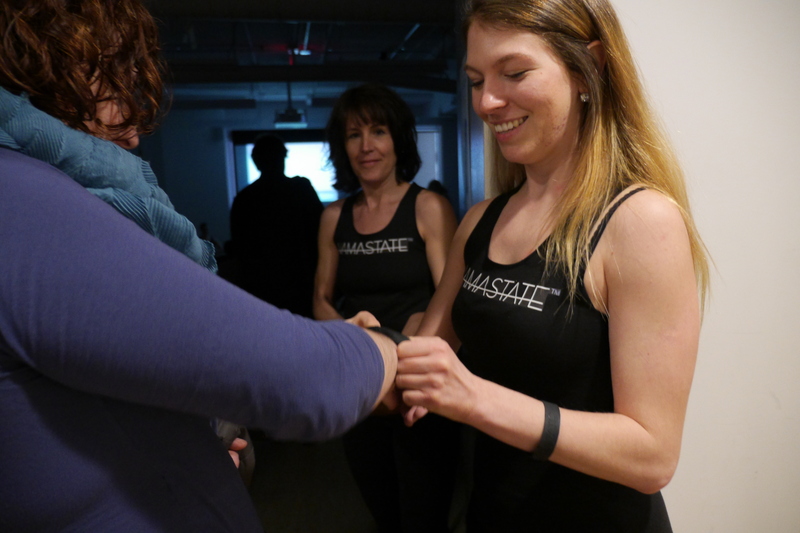 Namastate coordinators distribute wristbands and lead participants to their mats. The yoga instructor leads a familiar feeling yoga class except the traditional ancient moves were branded. Moves were re-named: “Google Mountain Pose”, “Lego Child’s Pose” and “Starbucks Stretch”. We had a Brandstructor host that would take readings of the room and monitor participant’s BrandfulnessTM. 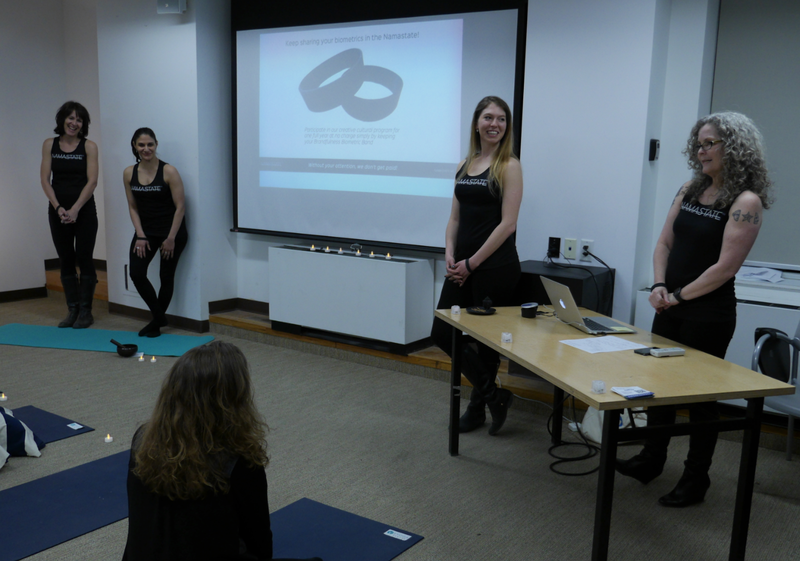 Based on how receptive the participants are to the brands being described by the yoga instructor, the engagement measurement levels would indicate whether a participant would be allowed to stay. Namastate Brandstructor monitors the live-action twitter feed. While Namastate Yogi encourages BrandfulnessTM. Participants would be tapped out if they weren’t trying hard enough. Projected on a screen in the front of the room we could all see tweets of what the participants were thinking and feeling. The Namastate class was just plausible and uncomfortable enough to feel like we made a real impact. The force of this was felt most keenly by yoga practitioners who literally shuddered to think that their sacred yoga practice could turn into something like this. Namastate group at the debrief. Please check our site for more information on how to achieve BrandfulnessTM. This clip is a rough collection of moments throughout the experience. See the class in action, and hear participant reactions.